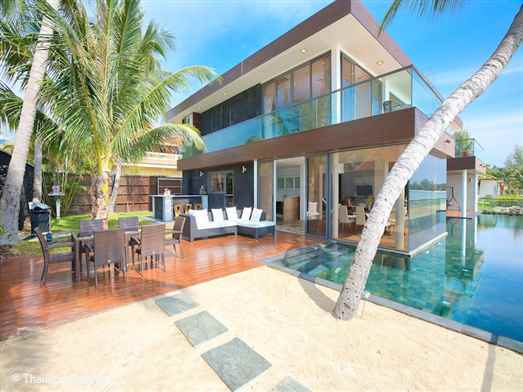 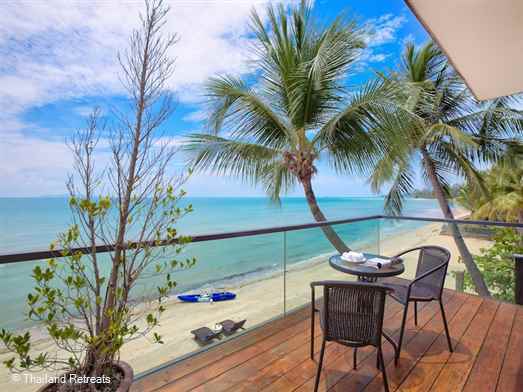 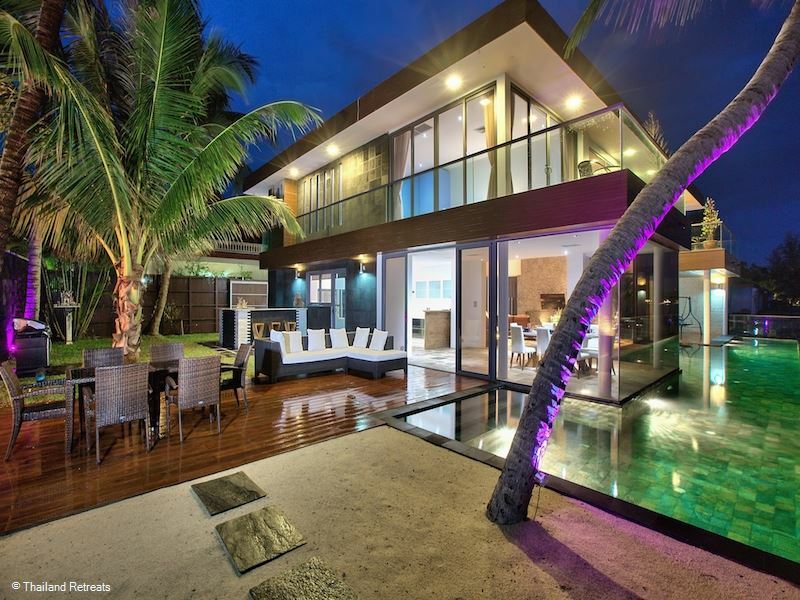 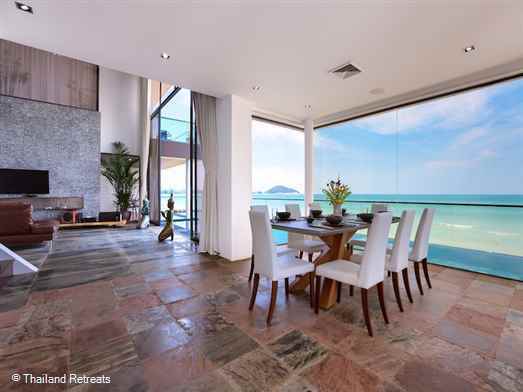 Comfortably furnished beachfront villa with an infinity lap pool on a quiet sandy west coast swimming beach. 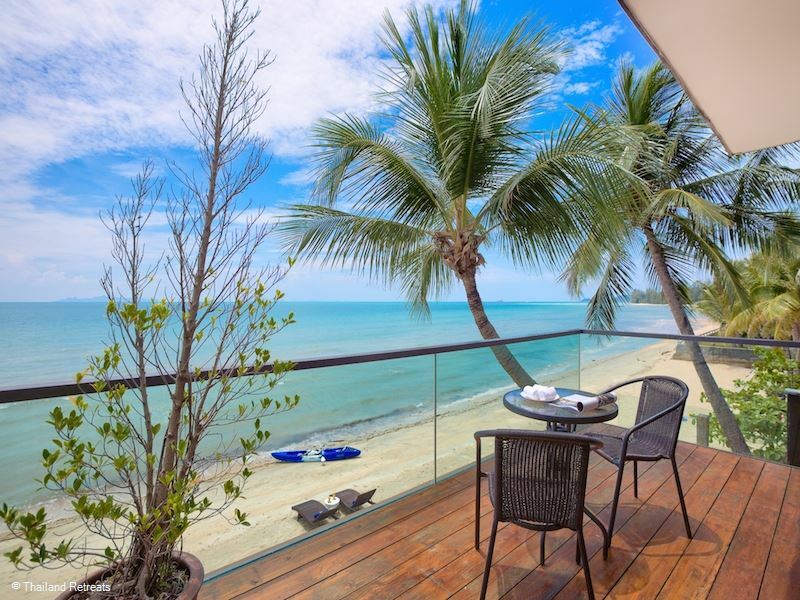 Walking distance to beach restaurants including Nikki Beach Club - great for Sunday Brunch and cocktails. 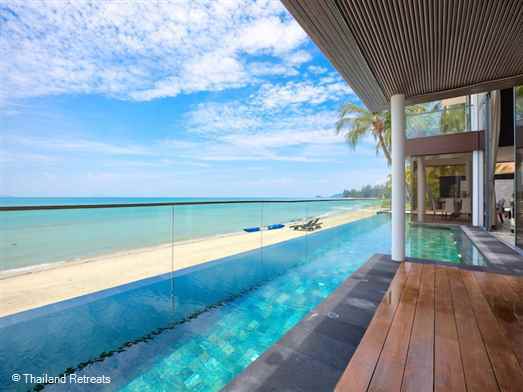 Villa U is a glass fronted beachfront property in a quiet location and set on the sandy west facing Lipa Noi beach and offers 3 spacious en-suite bedrooms - ideal for a perfect beach holiday getaway with family or friend. All 3 of the bedrooms can be considered as 3 masters as all have super en-suites and their own private terraces. 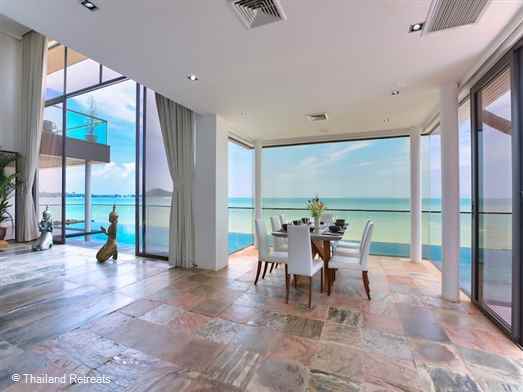 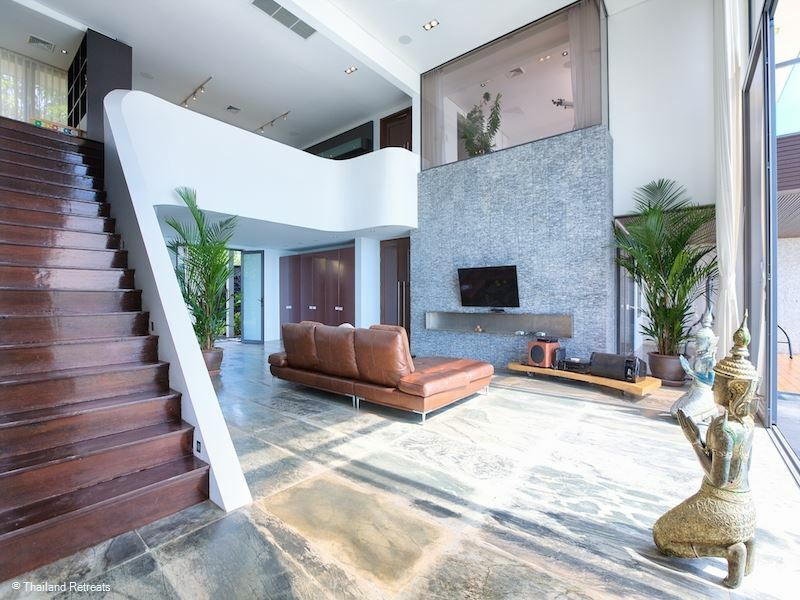 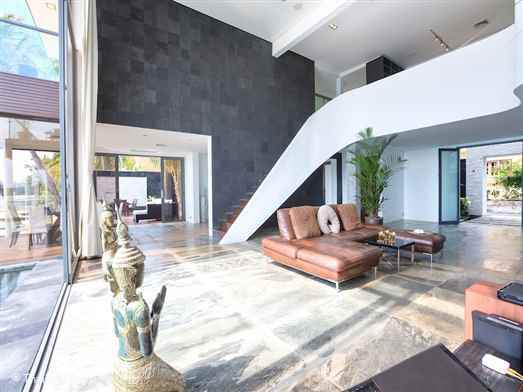 The villa is entered from the parking area straight into the vast air conditioned lounge area it's double height floor to ceiling glass windows providing amazing ocean views and giving the room a light and airey feel. The glass doors open out to a decking area in front of which is a super 25m lap pool sitting abve the sand protected by a glass barrier screen. The lounge has a multi coloured slate floor and predominently black and white decor created by the innovative architectural design and harmonious blend of modern and natural interior furnishings. 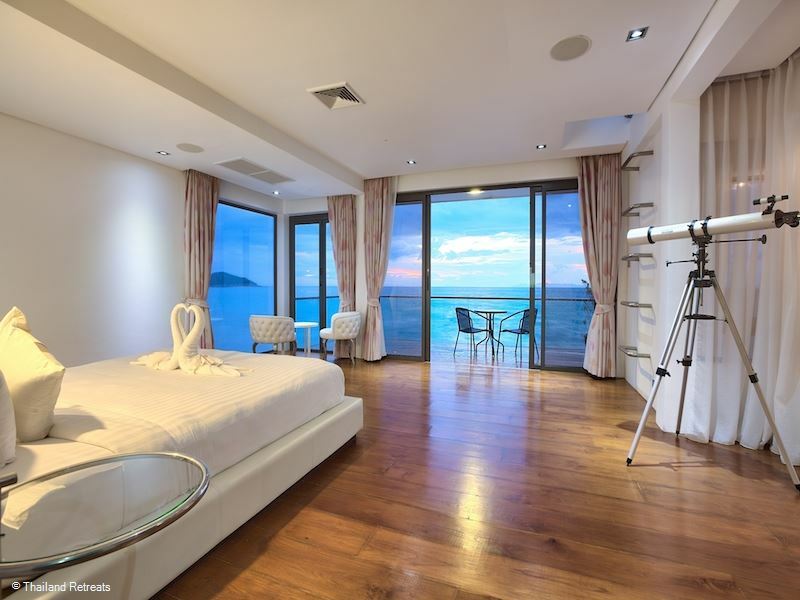 It is furnished with a comfortable sofa and state of the art home technology with a wall ung 55" 3D TV with satellite TV as well as an apple TV unit and x-box loaded with a selection of games. 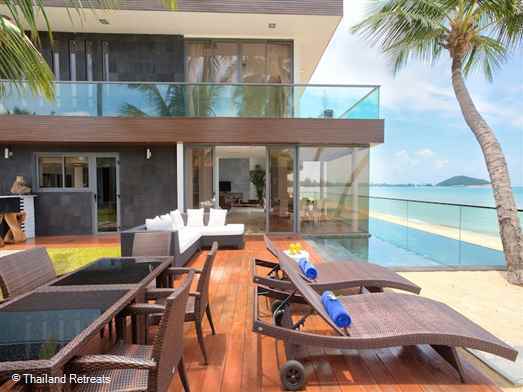 Guests staying at the villa can also listen to their favorite tunes through a 0.5kw sound system and bluetooth boom box. The air conditioned oceanfront dining area is separated from the lounge on one side of the villa and is furnished with a contemporary style teak table with with black top and white chairs seating 8 persons. Located behind the dining area is the fully equipped modern kitchen where you can cook and still enjoy the sea views. 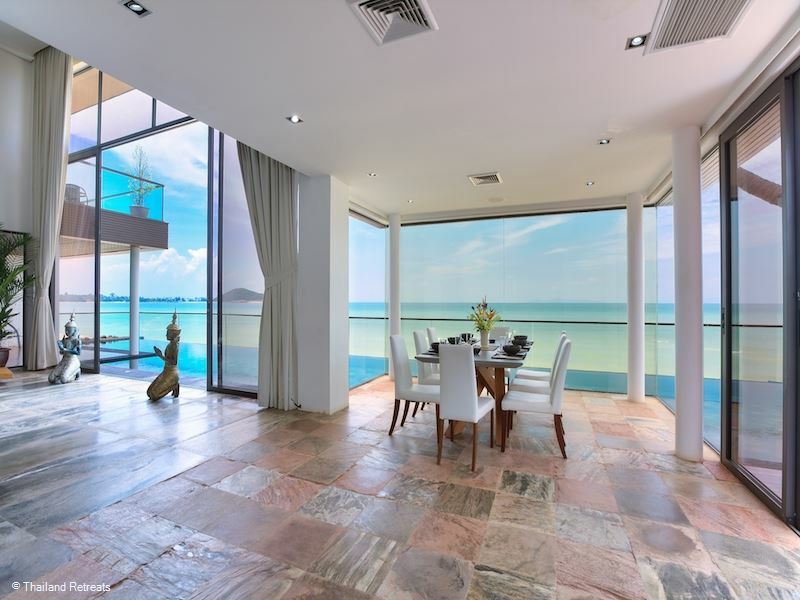 Glass doors lead out from the dining area to the side of the villa and the main outdoor living area for al fresco dining with a small lawned area with bar and BBQ. The decking is furnished with a table set seating six, a cushioned sofa set and sun loungers all positioned to enjoy the stunning beach and sea views. 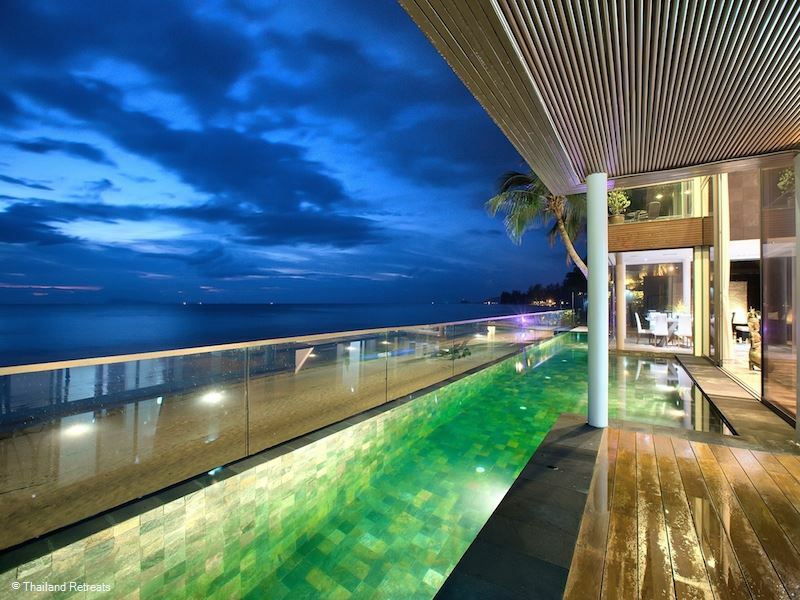 The decking is slighly elevated so a few steps lead down from here to a door opening on to the beach and the large glass fronted infinity pool runs parallel to the ocean. 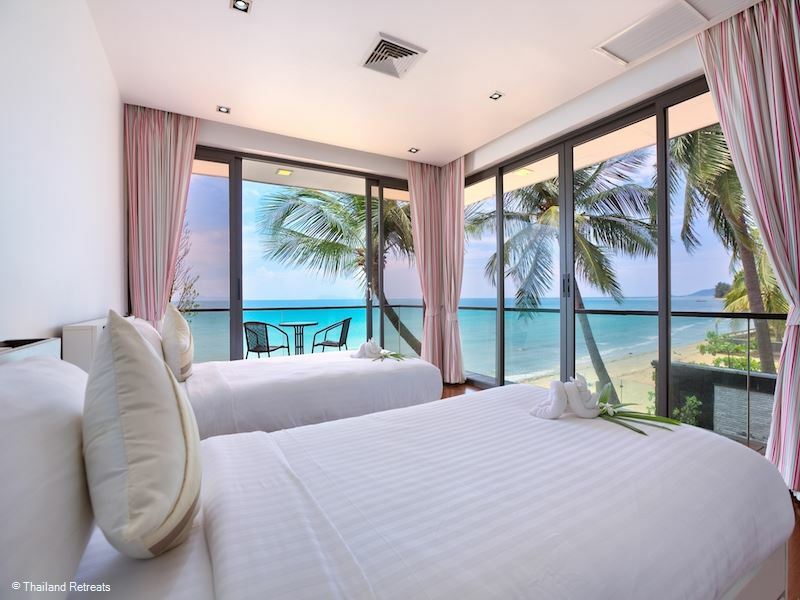 There is a bedroom on the ground floor acessed through double doors from the living room and has an en-suite bathroom with wet room shower and a dressing area. 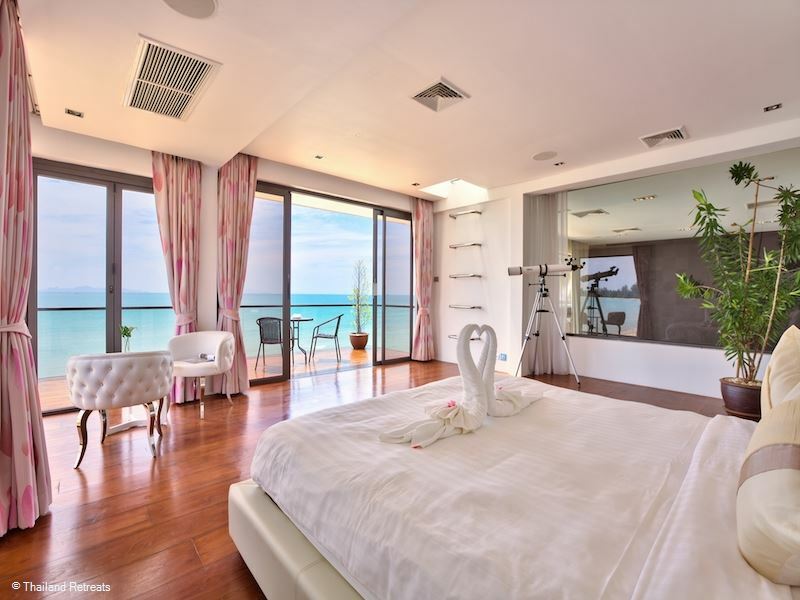 The bedroom has a king size bed, TV and dressing table and sliding floor to ceiling windows open out to it's own private terrace with patio furniture. Access to the upper floor is via a hardwood staircase and opens on to a mezzanine level furnished with another sofa and a 42ins TV with satellte channels. One one side of this level is the main bedroom which has a super en-suite with jacuzzi bath and dressing area and is furnished with a king size bed.There is also a telescope in the room and a viewing window overlooking the living room. Sliding doors open on to the bedroom's own private terrace furnished with patio furniture. 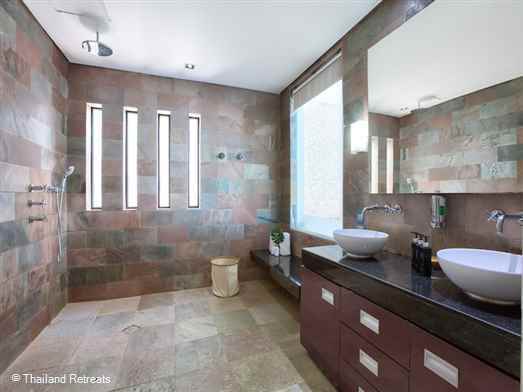 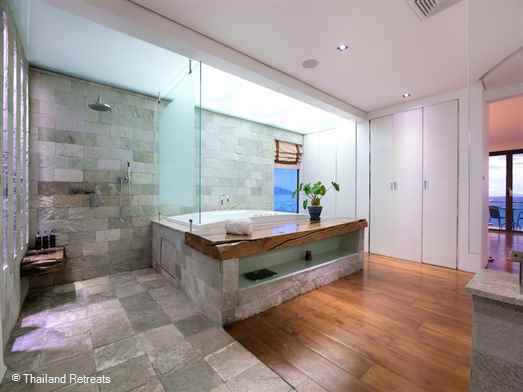 The 3rd bedroom is located on the other side of this floor wth an en-suite bathroom with shower over an oversized bath. 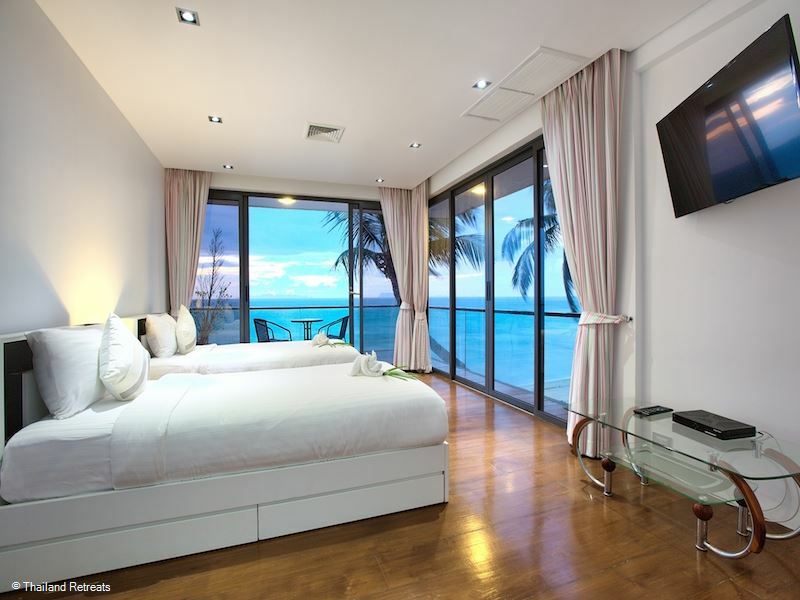 This bedroom has twin beds, a TV and it's own private terrace. 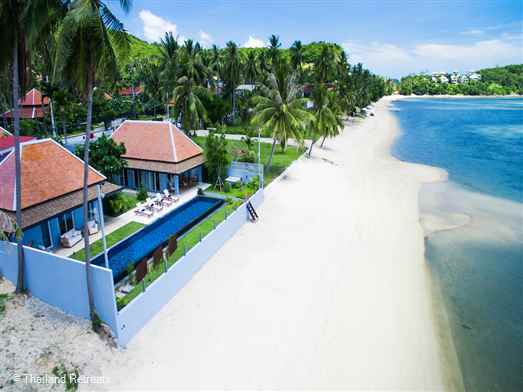 The beach in front of the Villa U is not a tourist beach due to the location of Lipa Noi being off the beaten track from the main ring road around Koh Samui and the distance it is from the main tourist towns. 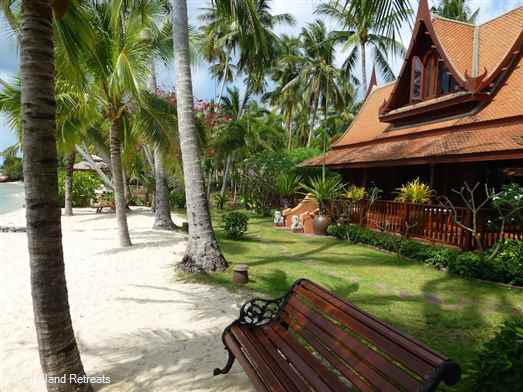 Visitors to Samui like to visit Lipa Noi and enjoy a long beach walk or a jog. Along the beach you will find some small resorts with restaurant facilities serving both Thai and international food and a short distance away is the famous Beach Club, Nikki Beach renowned for it's Sunday Brunch and themed pool parties attracting many visitors world wide on these occasions. 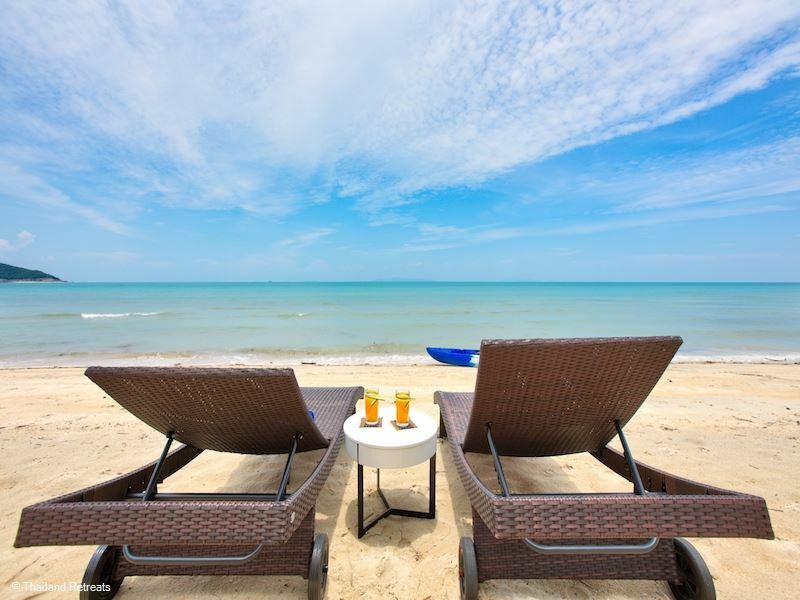 The nearest town is the ferryport and administrative town of Nathon just 5- 10 minutes drive away however there are plenty of tourist shops, regular shops and chill out cafes to enjoy. 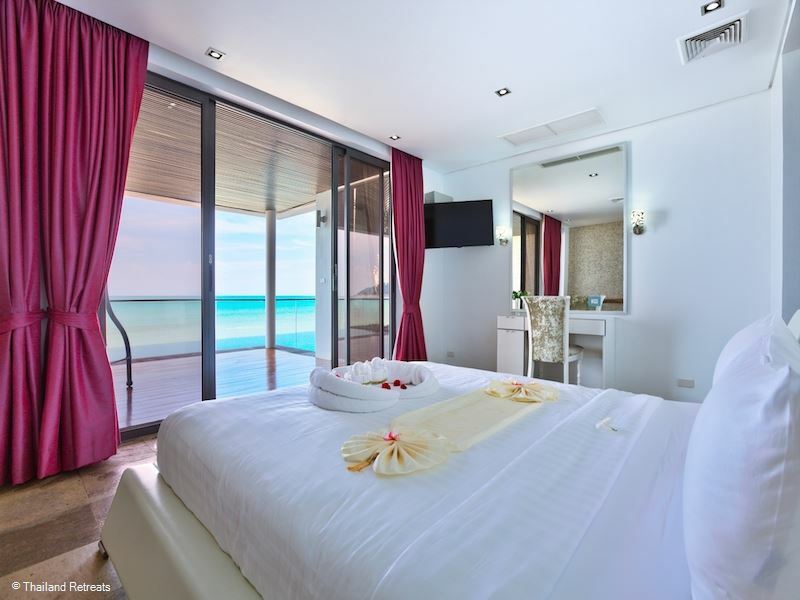 The main tourist towns of Lamai and Chaweng are approximately 30 - 40 minutes away and the popular Fisherman's village being 25 minutes drive away. 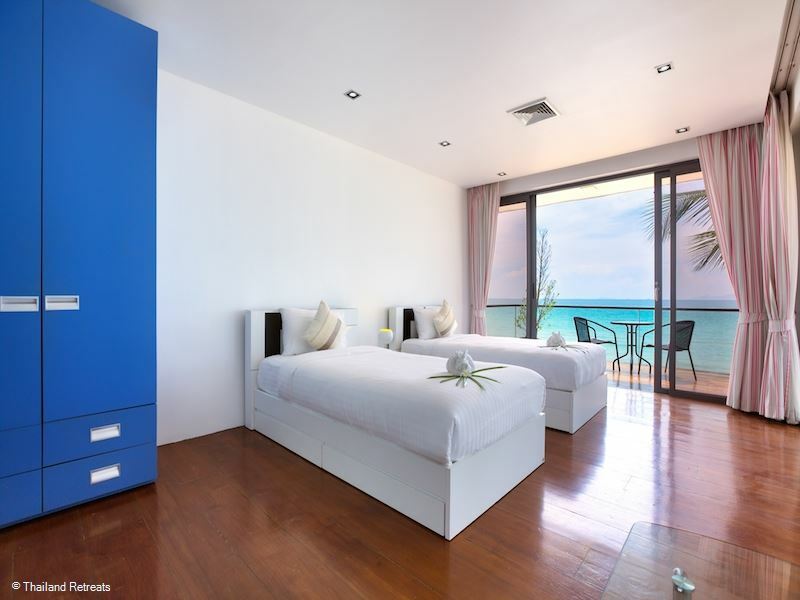 All bedrooms have twin vanitory units and dressing areas. Akuvara is a comfortable beachfront family holiday villa set on the quiet white sands of a west facing beach. 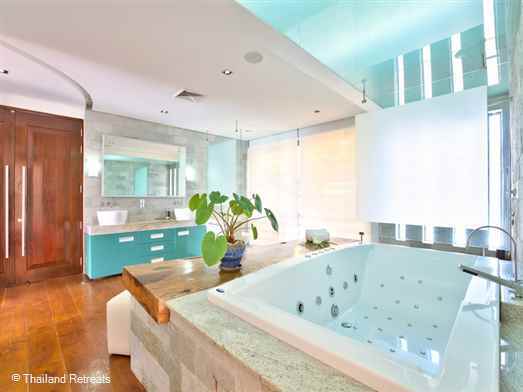 Perfect for swimming and occasional snorkel opportunities. 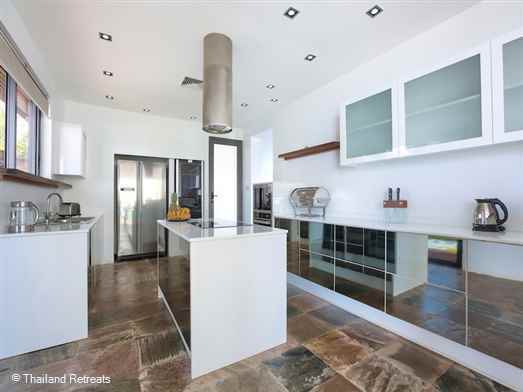 Offers for 2,3 and 4 bedroom use certain seasons. Ama Lur - a fabulous villa situated close to a small south coast fishing village. Has stunning views from this beachfront position. 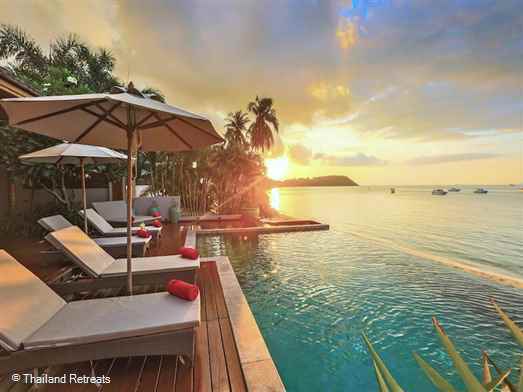 Perfect for reunions, celebrations and weddings. 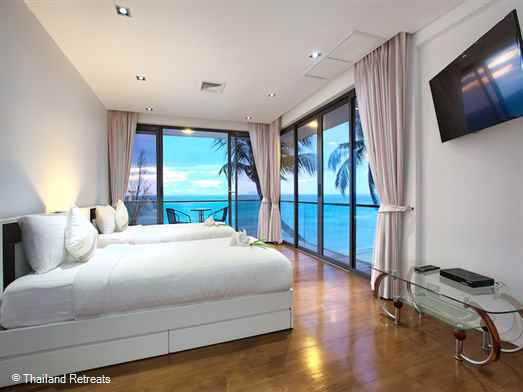 Offers rates for 3 & 5 bedroom use certain seasons. 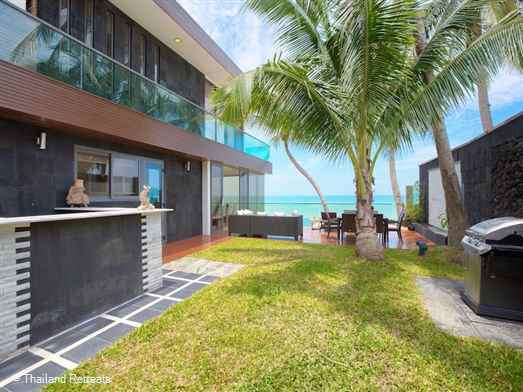 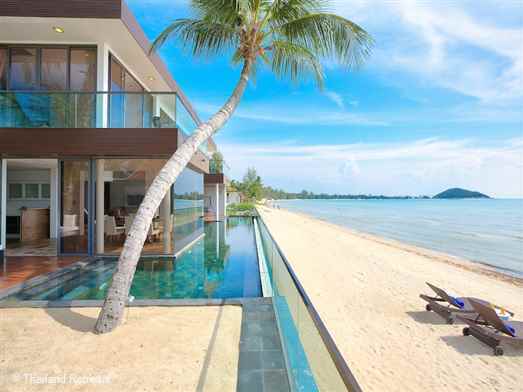 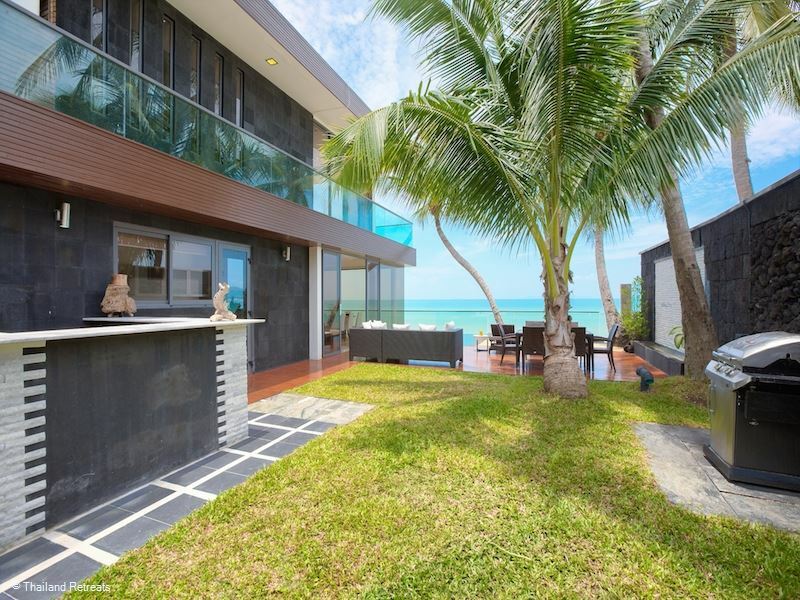 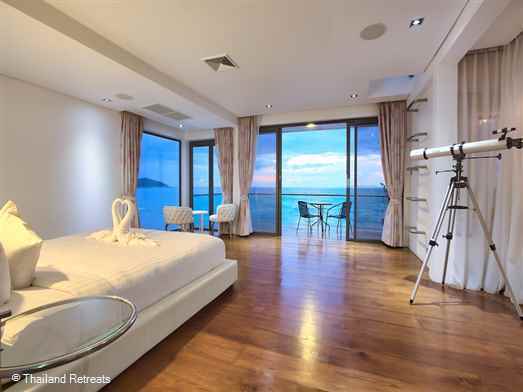 Baan Dalah is a perfect Koh Samui beachfront holiday villa set on a palm fringed sandy beach stretching for 4km. 5 mins drive to Fisherman's Village. 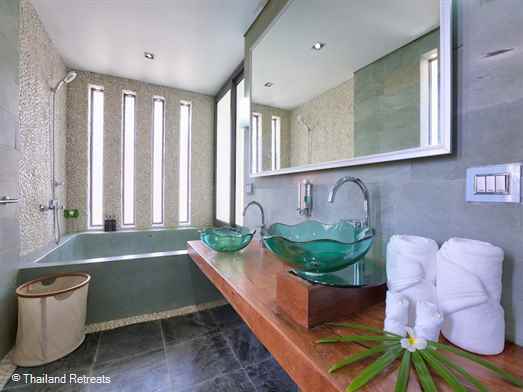 Rates offered for 2 & 3 bedroom use certain seasons. 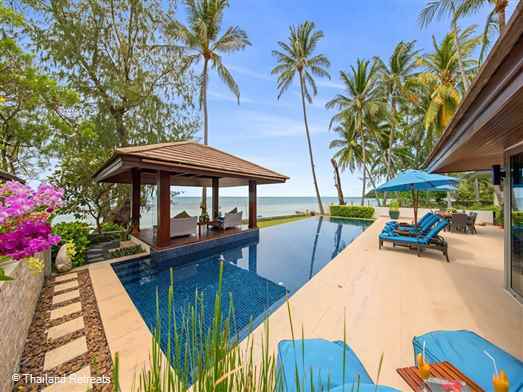 A spacious authentic Thai-style beachfront property with private pool located in a tranquil setting on the beautiful south west coast. 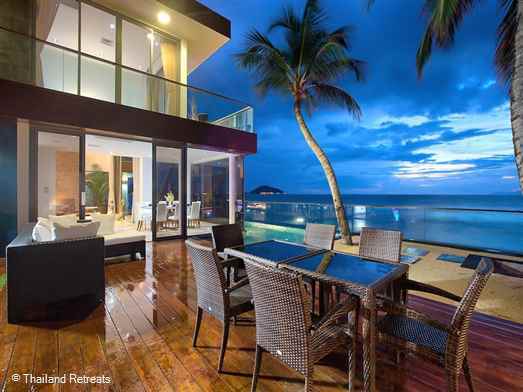 Amazing sunsets and walking distance to beach restaurants.